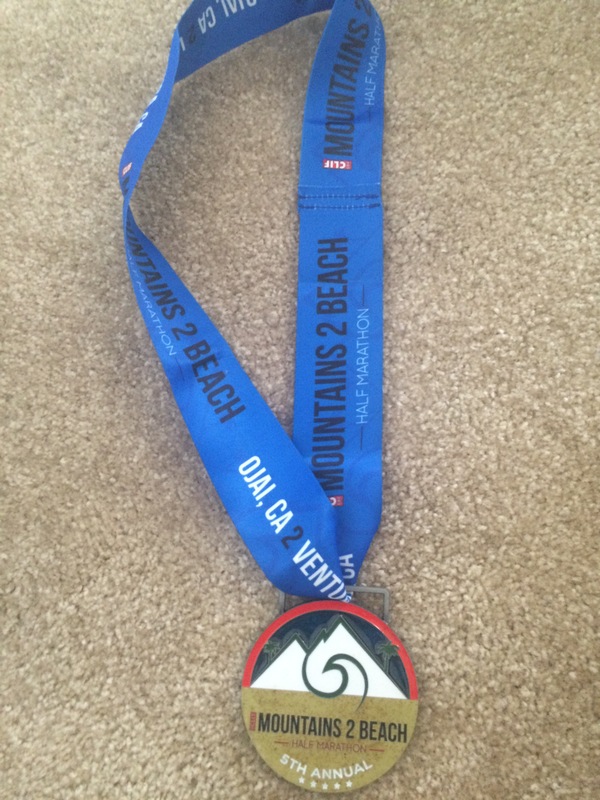 I’ll cut to the chase: I met my goal last weekend at the Mountains 2 Beach Half Marathon, breaking 1:55 by 13 seconds (1:54:47 official time) and setting a three-minute PR. I’m still basking in my post-PR glow, and I feel so vindicated and relieved that my focused training led to the result I wanted. Finishing with a 7:48 pace. I really wanted to break 1:55! Backing up, Jesse and I arrived in Ventura for Saturday’s expo after flying to LAX on Saturday morning. This was easily the most disorganized and anxiety-inducing expo I’d ever attended. 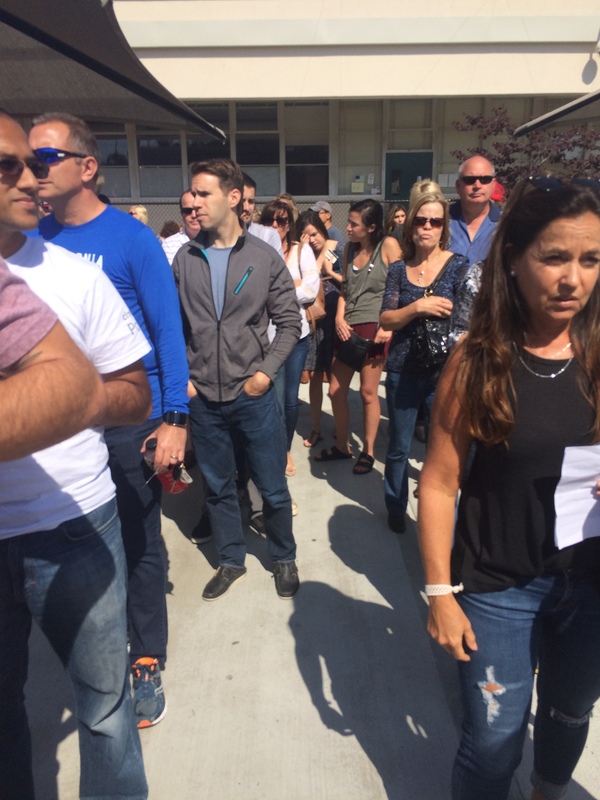 Located in a high school quad, there was one line for marathon runners and one line for the half marathon, leading to extremely long lines and cranky participants. The bib pickup line was separate from the t-shirt line, which seemed inefficient. The high school volunteers didn’t really seem to know what they were doing. A small glimpse into the terrible lines at the expo. While Jesse toyed with the idea of running the half, he ultimately decided to default to next year’s race. This was a smart call, given that he was only cleared to run last week! After an almost entirely sleepless night and a 4am alarm, I felt exhausted and nervous about starting the race. My stomach also felt terrible, which is never how you want to go into a race, and I thought I could kiss my PR goodbye. I ate a bagel with almond butter and grabbed a cup of coffee from Starbucks before Jesse dropped me off at the race start. The race start was a little chaotic like the expo. A group of six porta potties were located near the drop off location, before the actual starting line, and then a larger group of porta potties were located basically on the starting line, making the area congested and unpleasant. I went to the bathroom my requisite three times (it’s ridiculous, but I’ve learned this lesson the hard way too many times) and queued up my playlist while waiting to start. 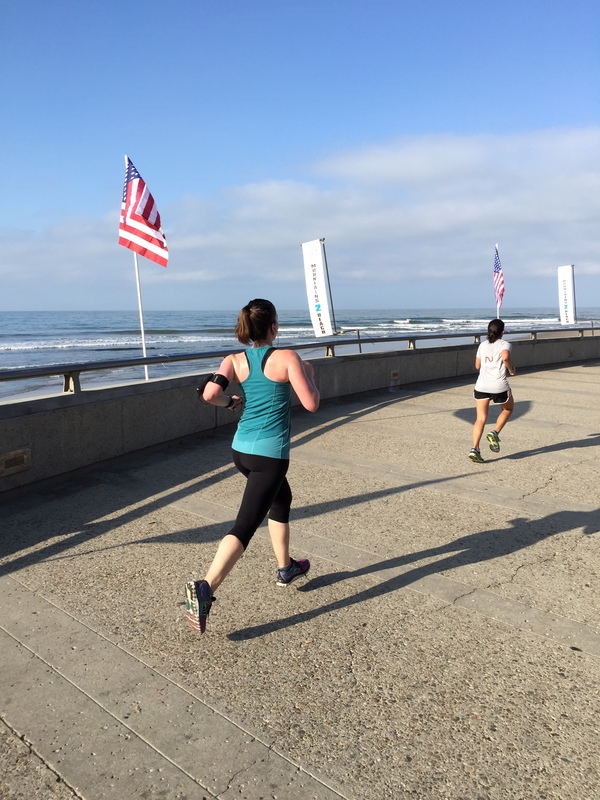 When the gun went off, I felt much more confident and easily slipped into an 8:30 – 8:40 pace. I toyed with the idea of following the 1:50 pace group, but ultimately decided to run by myself for fear of burning out too early. The first part of the course led runners up the mountain and then back down (to where we started) and then on the trail toward the beach. I felt strong, making myself hold back and stay on pace. Once we started running downhill (around mile 3), the San Franciscan in me expected to be led up a massive mountain at any turn, but we kept running at a gradual decline on the Ventura River Trail, which felt really, really nice. The sun was rising, and the morning was absolutely beautiful. I hit 7 miles in almost exactly one hour and felt strong. Once we left the trail and entered city streets (around mile 9), I started to struggle. Between the twists and turns around the neighborhood and my desperate need for calories, I started to doubt myself. Approaching a Clif aid station, I was sure I’d find the bloks I rely on during training but was disappointed to see only gels. Gels upset my stomach, so in that moment I had to decide between taking a chance and eating the gel for much-needed calories or forgoing the calories to ensure a happier stomach but risking a bonk. I chose the latter, which I do believe was the right decision, but I definitely paid for it. At this aid station, I drank some electrolytes and immediately felt better for about 1.5 miles. Around mile 11, the course took us past the finish line for a last out and back. 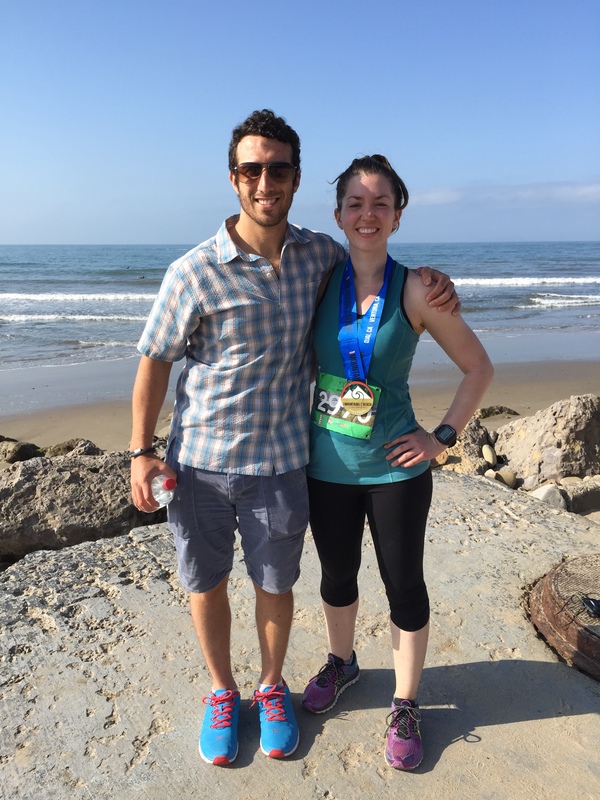 This out and back felt like a death march to me – I did everything I could to maintain a pace close to the one I’d been holding throughout the race while my breathing became labored and I got the chills. After finally turning around for the finish line, I wanted to stop and walk and collect myself so badly but knew I needed to maintain my pace if I wanted to finish sub-1:55. At mile 12, I did some (fuzzy at this point) math in my head and determined I could still meet my goal but needed to trudge forward. With about one-third of a mile left to go, the finish line came into view, and I finished strong in a way I never had before. I quieted all of the crazy thoughts I was having and ran as fast as I could towards the finish line. I saw Jesse and tried to forge a smile before finally crossing the finish line in 1:54:50 (according to my watch). 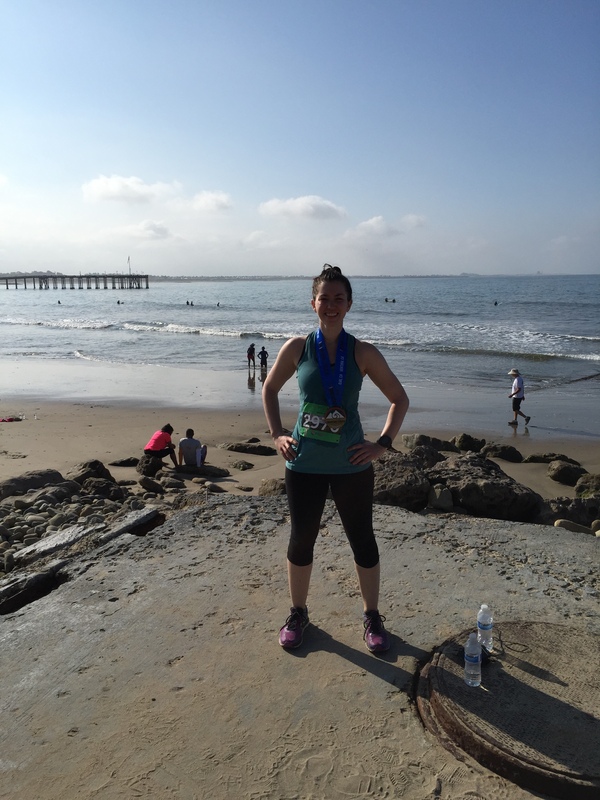 Posing in front of the ocean post-race. When I found Jesse, I just kept saying “I did it!” I was so excited that I had come to run a sub-1:55 and achieved my time goal. I haven’t really properly trained for a half marathon since my first half in 2010 (2:04), and I wanted a big PR and the validation that my training had been adequate. 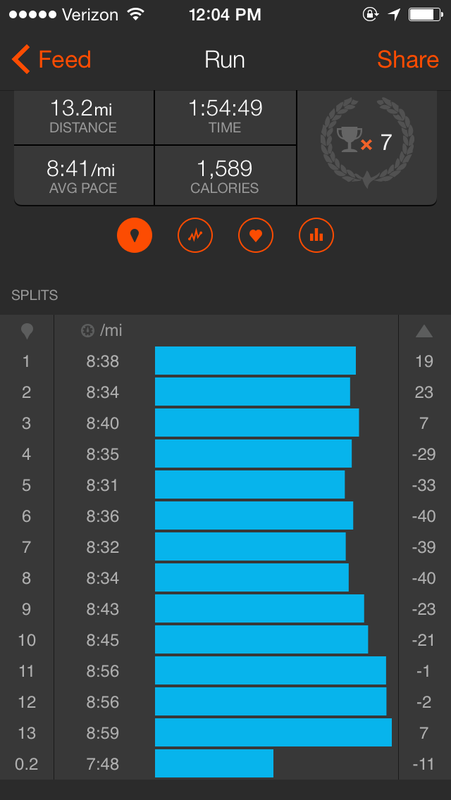 While super consistent for the first 10 miles, my last 3 miles slowed down considerably. I’m happy I kept my pace below 9 min/miles, considering how bad I felt. The post-race food options were not so good. I picked out the watermelon and banana, but we were given junk food like M&Ms and Clif gel (?!?!). I found it abysmal that the race directors didn’t provide runners with any protein option (muscle milk or chocolate milk would have been nice) after they finished. Participants had to pay for beer and the food truck options (I bought a tasty beet and ginger juice). We had wanted to wait for Lily to finish, but I really needed calories after that effort. We drove back to our Airbnb in Westlake Village and grabbed lunch at Marmalade Cafe. While I was huffing and puffing and bonking during the last few miles, I kept thinking to myself that I would not put myself through the torture of a half marathon PR effort for a while. Now that I can walk again (my quads were more tender than they’d ever been after a race – thank you, downhill miles), I’m reconsidering gunning for a PR again next year since Jesse’s guaranteed entrance into this race. If I do gun for sub 1:50 next year, I’ll bring a hand bottle and some fuel – lesson learned! Thank you to Jesse for the support and for spectating! Yaaaay congratulations again! I knew you could do it! Enjoy your recovery, you have certainly trained diligently and earned it! Not a bad idea. I may have to reconsider. 🙂 Thanks Hanna! AWESOME!!! CONGRATS!!! You went for it and got it!! Do you think if you had started a tad slower you could have gone faster at the end? That is too bad about the nutrition too! I am sure that had some effect on you and could PR again sooner than later! I think I would have bonked regardless of my pace at the beginning but who knows really? That’s a good idea with gels – I’ll try that during some future training runs as I gear up for Berlin. I am so happy for you! You gotta feel so good accomplishing your goal. You really laid it all out there, that’s awesome! 🙂 Too bad about the race organization though! Congrats on your awesome time!!! Sorry the race was so disorganized. Everything I’ve heard about this race prior to this would have made me think they did a better job. That’s a great medal, and you earned with all your hard work!! Great job! I’ve run two half marathons since my sub 2 PR and neither were PR attempts, which was really nice. 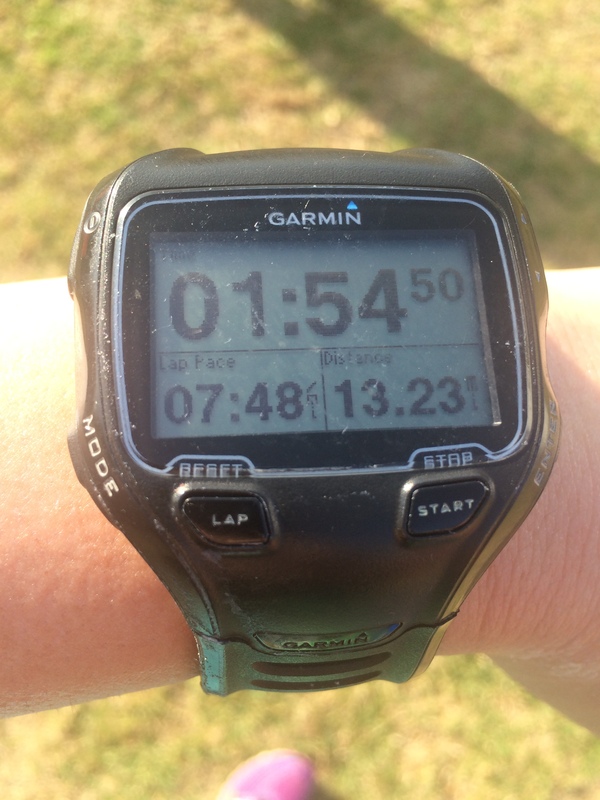 PRing a half marathon is uncomfortable for a really long time! Yay!!!! You did terrific. It’s so wonderful when the training pays off big time. I’ve heard so many good things about that one!! Yours spot on – my hesitation this year is with Berlin. Are you racing humboldt? I’ll be there again this year! Ran the full last year but sticking with the half this time. Might shoot for a PR myself! Congrats on the great run. I find expos like that to be infuriating. There is a 15k near our lake house that I LOVE doing but the expo and packet pickup is so frustrating. They never open on time and it leaves us waiting outside in the heat forever. Once they opened up the boxes of shirts right before they opened the doors, only to discover the shirts weren’t organized by size. So we had to wait an hour after getting our packets to get our shirts. Every year I say I won’t do it again. But the race itself is so fun. I think your training was so wise and well planned out. The bonk was probably inevitable and I don’t think it has anything to do with starting out too fast or too hard. Some days just work better than others. The only thing I always recommend to anyone racing is to always bring your own fuel to a race. Even if they advertise that they will have exactly why you always use, sometimes they change it at the last minute and mentally and physically it is so much easier knowing you have it when you need it. I have even safety pinned a pack of blocks to my shorts or a wrist band before. Congrats! Amazing PR! THREE minutes?! That’s incredible. I love how Jesse was considering running the half, HA! Sounds like something I would also consider. Even with the chaos of the race itself, it sounds like a cool event. It sounds like you ran a really smart race, and I totally understand how it feels when fuel doesn’t agree with you. I bring my own gels but usually can handle whatever beverages are on the course. I try to alternate water and electrolytes if possible. You are totally capable of sub-1:50. GET IT!!! Huge congrats to you! Awesome job — way to go! Congrats Taylor!!!! That’s an amazing time! I’m so glad you had a wonderful race 😀 In my opinion, you really didn’t even slow down much at all – did you see my horrible splits from the Brooklyn Half?! I started off at sub-8 pace and miles 10-12 were above a 9-min pace! Haha…not the best way to run a race. Anyways, you did great! Congratulations Taylor, nice job on the PB!